Dahui Zonggao 大慧宗杲 (1089–1163) was born in Xuancheng 宣城 in present-day Anwei; his family name was Xi 奚. He left home at the age of sixteen and entered Huiyun si 慧雲寺, a temple on Mount Dong 東, where he was ordained the following year. From early on, after reading the Yunmen guanglu 雲門廣錄 (Extensive record of Yunmen), he felt a special sense of relationship with Yunmen Wenyan 雲門文偃 (864–949). During an extensive pilgrimage Dahui studied under some of the important Caodong masters of his time, and, later, under Zhantang Wenzhun 湛堂文準 (1061–1115) of the Huanglong line of Linji Chan. Following Wenzhun's death, Dahui, on Wenzhun's deathbed advice, joined the assembly under Yuanwu Keqin at the temple Tianning Wanshou si 天寧萬壽寺 in the capital, Bianliang 汴梁, in modern Kaifeng. One day during a lecture Yuanwu said, “A monk asked Yunmen, ‘What is the place from which all Buddhas come?' Yunmen replied, ‘East Mountain walks on the water.' But if I were asked the same question I would simply say, ‘A fragrant breeze comes from the south, and in the palace a refreshing coolness stirs.” At these words Dahui was greatly enlightened. Dahui eventually became Yuanwu's dharma-heir and succeeded him as master of the monastery. His renown soon spread as far as the capital; in 1126 he was given a purple robe and an honorary name, Fori 佛日, by Lu Shun 呂舜 (n.d.), Minister of the Right. When the Northern Song dynasty fell to the invading Jurchens in 1127, Dahui fled south and lived for a time with his teacher Yuanwu, then residing at the temple Zhenru yuan 眞如院 on Mount Yunju 雲居. Following Yuanwu's return to Sichuan in 1130, Dahui built a hermitage on the mountain where a Yunmen temple had formerly stood, and soon attracted a large following. He later moved to Yunmen an 雲門庵 in modern Fujian. In 1137, at the invitation of the prime minister, Zhang Jun 張浚 (a former student of Yuanwu), he went to Mount Jing 徑 near the city of Hangzhou 杭州. The assembly under him there is said to have numbered over two thousand. In 1141 Dahui was laicized for advocating armed resistance against the Jurchen invaders of the Northern Song. He retired to Hengyang 衡陽 in modern Hunan and there wrote his Zhengfayan zang 正法 眼藏 (Treasury of the true dharma eye). In 1150 he moved to Meiyang 梅陽 in modern Guangdong, then in the midst of a plague that eventually took the lives of half of his students. He devoted himself to helping the populace, remaining even after he was officially pardoned in 1155, until in 1158 he returned to Mount Jing on imperial command. There he soon attracted an assembly of about 1,700 students and received the patronage of Emperor Xiaozong 孝宗 (r. 1162–1189). He died in 1163, leaving ninety-four Dharma heirs. He was granted the posthumous title Chan Master Pujue 普覺禪師. Two of the best-known aspects of Dahui's teaching are his opposition to what he called the “silent-illumination false Chan” 默照邪禪 of the Caodong school, and his promotion of “koan-introspecting Chan” 看話禪, which from his time on came to characterize the practice of the Linji school. His ongoing debate with the eminent Caodong master Hongzhi Zhengjue 宏智正覺 (1091–1157) on the subject of silent illumination versus koan work is famous in Zen circles. The basic source for Dahui‘s life is Dahui pujue chanshi nianpu 大慧普覺禪師年谱 (Chronological biography of Dahui), compiled by his disciple, Zuyong 祖咏. There is also an inscription written by Zhang Jun 張浚, Dahui pujue chanshi taming 大慧普覺禪師塔銘 compiled by Zuyong, incl. in Dahui pujue chanshi yulu 大慧普覺禪師語錄 (T1998a = 47.811b-943a, esp 836-837). The Zhengfayan zang 正法眼藏 (Treasury of the true dharma eye) is a collection of koans and dialogues compiled between 1147 and 1150 by Dahui Zonggao 大慧宗杲 (1089–1163); the sermon referred to is in fascicle 2 (x 67, no. 1309, 574b–c). The Zongmen liandeng huiyao 宗門聯燈會要 was compiled in 1183 by Huiweng Wuming 晦翁悟明 (n.d.), three generations after Dahui in the same line; the sermon is found in zh 20 (x 79: 173a). Dahui's Shōbōgenzō is composed of three scrolls prefaced by three short introductory pieces. Upon arriving in China, Dogen Kigen first studied under Wuji Lepai, a disciple of Dahui, which is where he probably came into contact with Dahui's Shōbōgenzō. Dahui also compiled the Ch'an-lin pao-hsun 禪林寶訓 (Treasured Teachings of the Ch'an Monastic Tradition), instructions of former Chan abbots about the virtues and ideals of monastic life, in collaboration with another monk, Ta-kuei. A disciple of Dahui, Tsu-yung, compiled a collection of Dahui's life and teaching called Ta-hui Pu-chueh Ch'an-shih nien-pu (Chronological Biography of Chan Master Ta-hui). The Chih-yueh lu, compiled by Chu Ju-chi of the Ming, also contains information on Dahui's teachings and is the basis of the J. C. Cleary translation Swampland Flowers, of which the majority is a collection of letters Dahui wrote to his students. Journal of Chinese Philosophy, V. 6 (1979), pp. 211-235. In: The Koan: Texts and Contexts in Zen Buddhism, edited by Steven Heine and Dale S. Wright. New York, 2000, Chapter 6, pp. 168-199. Zhu'an Shigui of Longxiang (1083-1146) [Chu-an Shih-kuei of Lung-hsiang] Chikuan Shikei of Ryūshō. A Dharma heir of Foyan Qingyuan, who was a student of Wuzu Fayan. Zhu'an is also known as Kushan [Drum Mountain], where he later taught and which was a center of Buddhist studies in Dogen’s time. 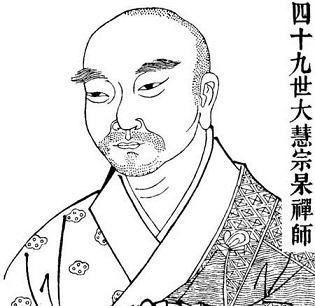 Zhu'an, who is praised by Dogen for his literary expression of Dharma, compiled a collection of stories, "Zen Gate Jeweled Instructions," together with Dahui. This is a remarkable text. Chinese Ch'an Buddhism, better known in the West by its Japanese name of Zen, is a subtle fusion of confucianism, Daoism and early Indian Buddhism. Its recorded writings, although distinctly Buddhist in nature, are nevertheless often presented in a structure similar to that found in the Confucian book known as The Analects (Lunyu). Zen Lessons is no exception to this observation. The original Chinese text that Zen Lessons is drawn from is known as the Chanmen Baoxun (or, 'Chanlin Baoxun'). This translates as 'Precious Lessons of the Ch'an Schools', and dates from the early Song Dynasty (960-1279AD). This text was compiled in the early twelfth century by Ch'an masters Dahui and Zhu-an, bringing together in one place, a compendium of private dialogue, discussion and letters, covering a broad range of questions regardimg the political, social and philosophical issues faced by Ch'an practitioners during the early Song. This Thomas Cleary translation offers the Chanmen Baoxun in an English language format that presents the work in 217 short chapters that range in constitution from anything between 5 or 6 lines, to 5 or 6 paragraphs. The text is comprised of material drawn from sources dated to around the early to middle Song Dynasty - the time of Dahui and Zhu-an's existence. The first Ch'an master quoted in the text is called Mingjiao, and the last Ch'an master to be featured is called Jiantang. Interestingly, one of the compilers - Dahui (1089-1163) - is mentioned in the body of the text, by the name 'Miaoxi'. Dahui has subsequently become famous for another work attributed to him, namely that of a collection of letters of Ch'an instruction, written by himself to many lay and monastic practitioners of Ch'an, thus demonstrating that an enlightened master can free the Mind with words either in person, or through the written word. JC Cleary has translated this work into English, entitled 'Swampland Flowers. JC Cleary is, of course, the brother of Thomas Cleary, and both have used their considerable translation skills to render The Blue Cliff Record (Biyan Lu) into English. This is significant, as the Ch'an master responsible for this excellent work - Yuanwu (1063-1135) - is also mentioned in Zen Lessons. This text and translation of Zen Lessons is something of a gem and is highly recommended for study by students of both Ch'an and Zen. The song Dynasty Ch'an masters were very concerned by the lack of standards even then, and how the perceived quality of Ch'an students had diminished considerably since the time of the Tang Dynasty (618-907). There is a sense of urgency in the presented wisdom. An urgency that fits well in today's age of corruption, war and injustice. A collection of 668 koans and dialogues compiled between 1147 and 1150. New York: Grove Press, 1977, Shambhala Publications, 2006, 176 p.
Ch'an master Ta Hui (1088-1163) lived during the Song Dynasty (960-1279). His name 'Ta Hui' was bestowed upon him posthumously by the emperor Hsia Tsung, and means 'Great Wisdom'. Ta Hui was the Dharma heir of Ch'an master Yuan Wu of the Lin Chi lineage of Ch'an - Yuan Wu is famous for compiling the Blue Cliff Record (Pi Yen Lu), a collection of Ch'an dialogues attributed to Ch'an masters throughout the ages. This collection is the English translation of the Chinese text entitled 'Chih Yueh Lu' (Records of Pointing at the Moon), volumes 31 and 32. As ancient China had a postal service, Ta Hui was able to keep in-touch with Ch'an students from around China. He let the brush slip from his hand, and peacefully passed away. 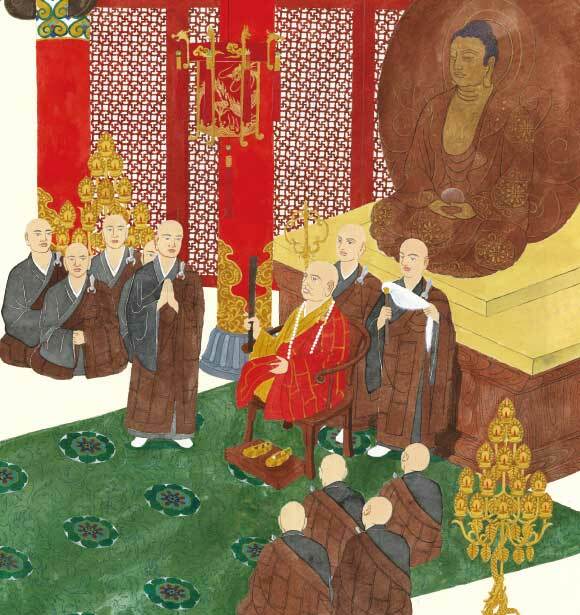 His students collected his teachings together, which are presented in this book. A delightful translation which all Ch'an and Zen students should earnestly study. Oxford, England: Oxford University Press, August 2017. 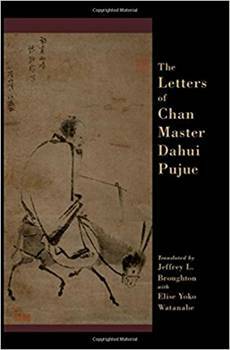 408 p.
Broughton and Watanabe's The Letters of Chan Master Dahui Pujue (hereafter “Broughton” and Letters) is the first complete English rendition of a collection of Chinese letters that circulated across East Asia. The epistles by Dahui (1089-1163) are one of the world's richest religious documents, containing profound discussions on faith, the importance of doubt, paradoxes of spiritual effort, and messages of transformation. The translators' sophisticated textual apparatus, including footnotes that selectively translate from historical Korean and Japanese commentaries, makes this book indispensable for future studies of Dahui's letters. Dahui was heralded by later traditions as the genius innovator of the kanhua meditative technique (Jap. kanna zen; K. kanhwa Sŏn) of examining the “head word” of a gong'an (“public case,” Jap. kōan). This kanhua practice as taught in the Letters is the root of modern popular understanding of “Zen koans” as riddles to disrupt discursive thought. Dahui, kanhua , and gong'an have each been frequent topics of scholarship. As Miriam Levering noted in her PhD dissertation (Harvard, 1978), Dahui's epistolary teachings have an enduring allure because they were addressed to the concerns of lay people. Excerpts from Dahui's epistles were previously translated by Christopher Cleary in Swampland Flowers (Grove Press, 1977). Cleary worked from the text of Zhi yue lu 指月錄 (“A Record of Fingers Pointing at the Moon”), a late 16th century anthology whose compiler abridged Dahui's letters to their pith. One of the strengths of the Broughton translation was the choice to follow a complete early Gozan edition. Cleary's translation, despite the lack of a scholarly apparatus and the interesting choice of using an abridged Ming recension, is accessible, fluent, and generally accurate. By comparison, Broughton's style is terse and closely follows Chinese idioms. The most original and likely enduring contributions of this book are its robust footnotes emphasizing historical exegeses of the epistles. The exegetical tradition is indispensable for interpreting thorny passages of epistolary Late Middle Chinese. The translators closely engage two Korean commentaries used in Sŏn seminaries since the 18th century—one by Chin'gak Hyesim (1178-1234) and an anonymous lexicon—in addition to one pre-modern Japanese commentary, two early modern Japanese commentaries, and several contemporary Japanese translations. Foremost in significance for the translators is perhaps Daie Fukaku zenji sho kōrōju 大慧普覚禅師書栲栳珠 (hereafter Kōrōju) produced by Japanese monk Mujaku Dōchū 無著道忠 (1653-1745), an erudite Zen monk and an expert on Song and Yuan era Chan. The translators present persuasive arguments when choosing to deviate from Mujaku's interpretations. Araki Kengo's authoritative 1969 annotated modern Japanese translation also relied on Kōrōju . The translators document their divergences from Araki as well. The result is an original work of interpretation that is profoundly informed by the Korean and Japanese traditions of exegesis and practice. This is a great achievement. Broughton's emphasis on Korean and Japanese receptions situates the Letters more within the field of Zen Studies than within the study of Chinese religions. As a result, there is more work to be done to study how Chan epistles participated in the broader culture of Chinese letters. Natasha Heller has already provided a foundational essay on monastic letters during the Southern Song and Yuan dynasties, “Halves and Holes: Collections, Networks, and Epistolary Practices of Chan Monks” (in A History of Chinese Letters and Epistolary Culture , Brill, 2015). Also related is Huang Qijiang's Bei Song Huanglong Huinan Chanshi sanyao 北宋黃龍慧南禪師三鑰 (Taibei: Taiwan xuesheng shuju, 2015), which meticulously analyzes another set of Song era epistles with transnational circulation. Dahui often crafted new ways of speaking while simultaneously engaging the expressions of earlier Chan masters. Perhaps it is fitting then that Broughton has experimented with English expressions, and at times deviated from well-tried translations. Some neologisms are clever. For example, an explanation of Dahui's idiosyncratic use of the verb guandai 管帶 is developed based on a gloss from Mujaku's Kōrōju . This yields the unusual “to continuously ‘engird mind' ” (18) as a description of wrong-headed effortful concentration of the mind. This mental girdle plays with the etymology of the second character in guandai : dai is literally to fasten or to belt on. (Rather than “engirding mind” I might have preferred “girding the mind,” which would resonate with the dated but idiomatic “gird the soul.”) Elsewhere, rendering mozhao 默照 as “silence-as-illumination,” well known to both scholarly and practitioner communities as “silent illumination,” recasts the term in the pejorative way Dahui himself treated mozhao . Other neologisms may distract. The genre of texts known as yulu is familiar as “recorded sayings.” The authors' preferred “sayings record” seems to introduce a distinction without a difference. Letters begins with an introductory essay by Broughton that foregrounds compelling speculation about the centrality of the layman Huang Wenchang as “editor-in-chief.” (6) The authors also contend that Dahui may have taught huatou meditation practice to lay people exclusively. With negligible exceptions, they claim, there is no evidence that Dahui recommended huatou to his monastic disciples. (10-12) If correct, the implications would be that later traditions adapted a lay practice into a monastic one—contra Dahui's own praxis. One brief correction. It is misleading to assert that Dahui was abbot of “the foremost of the official ‘Five-Mountains' Chan monasteries” (5-6) because the Five Mountains patronage system was only established in the first decades of the 13th century, after Dahui's life. Despite such minor quibbles and stylistic preferences, this book is a wonderful resource to all who would read Dahui's epistles. The inclusion of lucid translations from multiple historical commentaries—a rich exegetical apparatus—is a great contribution. We are all indebted to the translators' work. This chapter focuses on the image of Zen (Chan) Master Dahui Zonggao (1089–1163) presented in the Dahui's Letters (Dahui shu) and the Recorded Sayings of Chan Master Dahui Pujue (Dahui Pujue Chanshi yulu) . Dahui Zonggao permanently transformed Chinese Chan Buddhism. First, he was strongly influential in blending Chan with Huayan Buddhist philosophy; second and most important, Dahui devised a meditation method that has been fundamental to Chan practice ever since, the kan huatou method. Dahui Zonggao's influence has been vast, and a considerable part of his lasting attraction and popularity can be attributed to the image of his forceful, fearless and caring personality and teaching style found in his records. It is high time that we examined these texts in terms of the image of Dahui, his insights and ideas, his personality, and his teaching methods, for it is through this image that his influence has been felt. Ch'an Enlightenment for Laymen: Ta-hui and the New Religious Culture of the Sung. 1978, Harvard University. Prof. Masatoshi Nagatomi, adviser. Awarded "Distinction". Pujue Chanshi shu), a six-fascicle portion of the Recorded Sayings of Dahui Zonggao (1089-1163). and Korean Buddhist thought and practice. Taoist Studies series). Honolulu: University of Hawaii Press, 1987, pp. 181-206. "Dahui Zonggao and Zhang Shangying: The Importance of a Scholar in the Education of a Song Chan Master." The Journal of Sung-Yuan Studies 30 (2000), pp. 115-139. Was there religious autobiography in China before the thirteenth century? 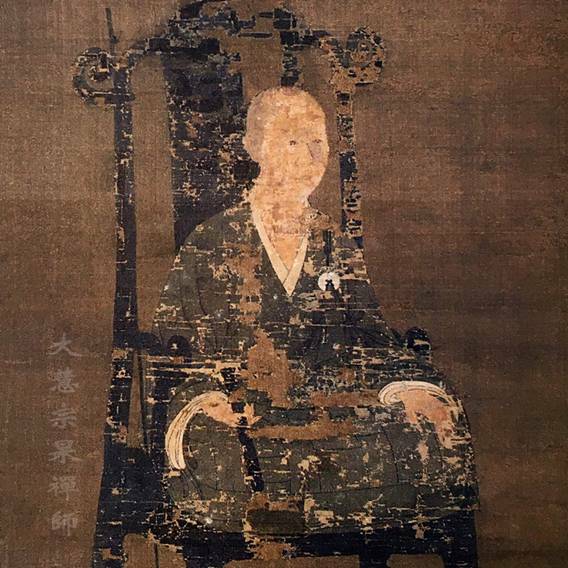 : The Ch’an master Ta-Hui Tsung-Kao (1089–1163) as autobiographer. Journal of Chinese Religions, 2002, 30: 97–119. edited by Peter N. Gregory and Daniel A. Getz, Jr.
(Kuroda Institute Studies in East Asian Buddhism 13, Honolulu: University of Hawaii Press), 1999, pp. 188-219.
only just wanting to show what one knows. same fierceness with which the eruption comes. also a little bit high, but it clicks off. And then for a week you let it stand there. delusion down, we’ve never tried it. fire by pouring on oil.’ What happens if there is a fire and you pour oil on it? matches and is on the right level. the opposite of that vast quietness. There is just nothing. that it can grasp it, and look at it as if it was something extra, something separate. with that - cannot be seen, it cannot be grasped, but it works. You cannot get it. And though you try to abandon it - this is the other side of it - it always remains. the situation, in obedience to the situation, and to the benefit of all concerned. Disappearing and appearing in the sea of birth and death, able to use it fully. together. Can we please take this to heart and ponder it down in the zendo?